Boulder, CO, WPH Press, 8/5/18– The East Boulder Rec. Center hosted the 2018 Shumate/Costigan CO 3-Wall Doubles, featuring a strong field that included defending champion and R48 #17 Jonathan Iglesias, R48 #12 and cross over star Shorty Ruiz, the Olympic Club’s R48 #20 Erik Torres, WR48 #6 Dr. Ashley Moler, former SR48 champion Bear Meiring, and the top outdoor stars from the Rocky Mountain Region and beyond. Jonathan Iglesias and Shorty Ruiz teamed up and advanced to the final in the upper bracket without dropping a game, including a two-game thrashing of Alejandro Ibarra and Luis Perez in the semifinals. 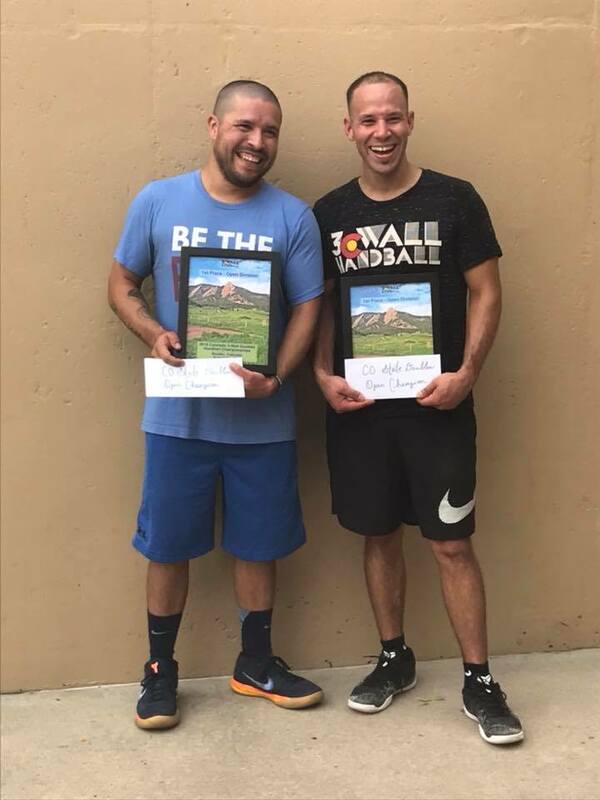 2017 Olympic Club singles champion Erik Torres and Olympic Club head handball coach Anthony Collado made the 1200-mile trip from the Bay Area and cruised to the semifinal to setup a showdown with Colorado’s second-seeded Bear Meiring and Armando Ibarra. Team Olympic Club outlasted Team Colorado in two grueling games at 5300 feet of elevation, outscoring the Coloradans by just five combined points in two games to advance to the final. Team Iglesias/Ruiz dominated game one of the final, keeping Team Olympic Club off-balance with hop serves and an aggressive fly game. Photos courtesy of Dr. Ashley Moler.